Over 250 teachers, families and donors gathered at the Shemer Art Center Saturday, January 19th to recognize the works of art selected for this year’s New Horizons High School Student Art Exhibition. Forty-one scholarships totaling $2,950 were awarded to 32 students. The 2019 New Horizons High School Student Art Exhibition, now on display at the Shemer Art Center for the 33rd year, is an amazing, annual student exhibit that each year showcases the two very best pieces of art from high schools across the Valley! This year we received 77 works of art from 40 high schools in a variety of mediums including drawing, painting, ceramics, photography, mixed media and digital art. 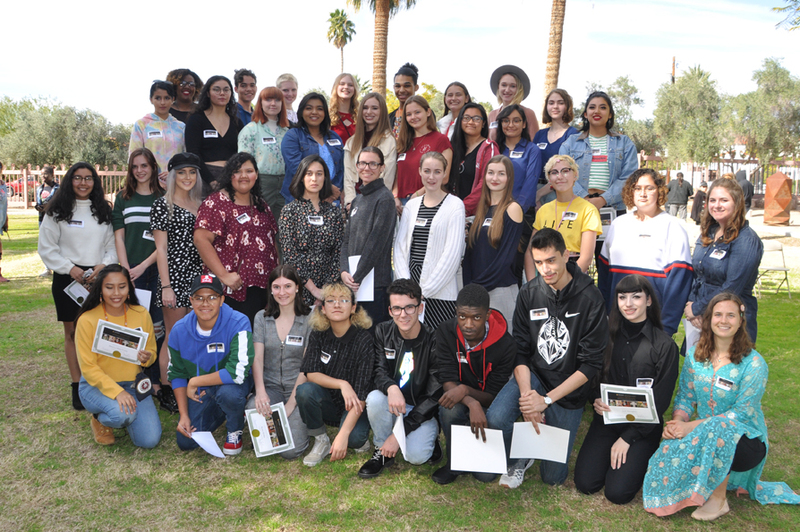 Once again they demonstrate the talent of our young Arizona artists and the quality of the art education they are receiving from art instructors at each school. At the award ceremony January 19 all participating students were recognized and this year’s scholarship award recipients were announced. Scholarships varying from $50, $75 and $100 were donated by Valley residents, many of whom have been long-time supporters of this exhibition, including the Shemer Family and the Shemer Art Center’s very first director. This exhibition is currently on display through February 14, 2019.